Taormina is a very picturesque small town on the eastern coast of Sicily and is a very popular destination. 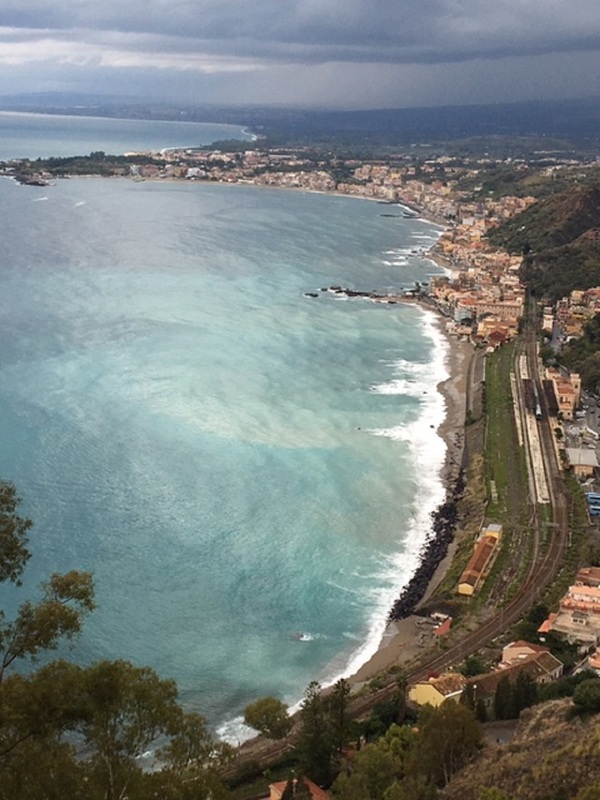 The views from this part of Sicily are well worth it that it really should not be missed. A stop in this town in a must! View from the top of Taormina. Hotels are located from the seaside area of Mazzaro’ to the top and the town is connected by a cable car. If your hotel is in the middle of the mountainside chances are the hotel has a shuttle to the top where the town is located. There are a few hotels at the the top and if you do not stay there it is worth a stop to have a drink and take in the views. My son and I decided to take in the views from the Belmond which is in the center at the top of Taormina. Pictured is the Belmondini. Delicious! Not far from our hotel, Grand Hotel San Pietro is the beautiful Villa Comunale di Taormina and it’s beautiful gardens. No entrance fees so if you are in the area it is well worth the visit. It is full of lush greens: palm trees, flowers and succulents. This statue is at the entrance to the gardens. While staying in Taormina many took advantage of the free time to shop in the many boutiques. I always give my group time to shop as it is so important to us ladies. In between time we had a tour of Mt. Etna with a wine tasting and then one day we took a cooking class in Catania with Monica Consoli. More on our cooking class in another post. 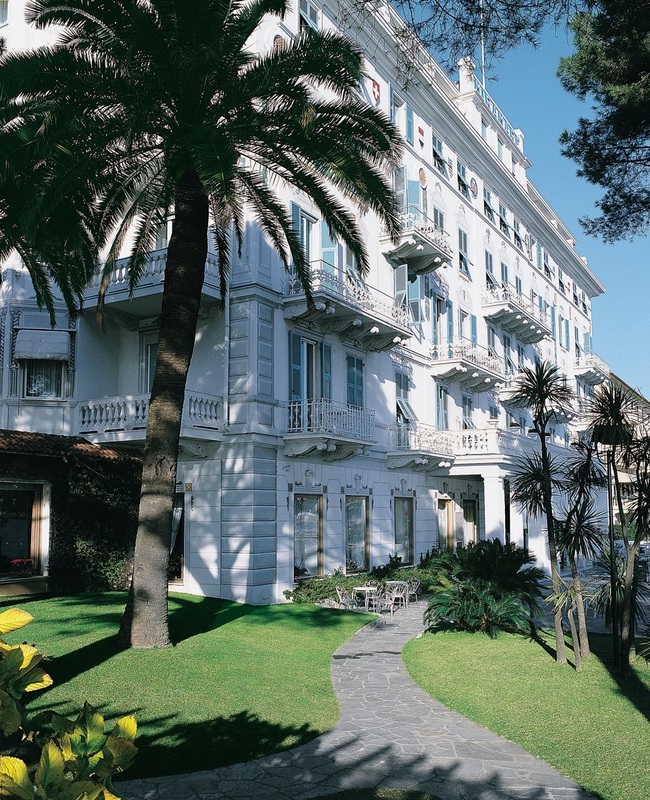 The Grand Hotel Miramare in Santa Magherita Ligure has an excellent location on the Italian Riviera overlooking the waters of the gulf. It has been owned for 75 years by the same family. Located in the heart of the Italian Riviera it is a great base for visiting the nearby towns of Portofino, Rapallo, Genoa and Cinque Terre. There is a beautiful salt water pool with beautiful gardens surrounding it. Can't you just picture yourself relaxing here! Maybe even enjoying an afternoon aperitif and enjoying the good life? Also, it’s guests can take advantage of the spa which offers extensive treatments available to both men and women. 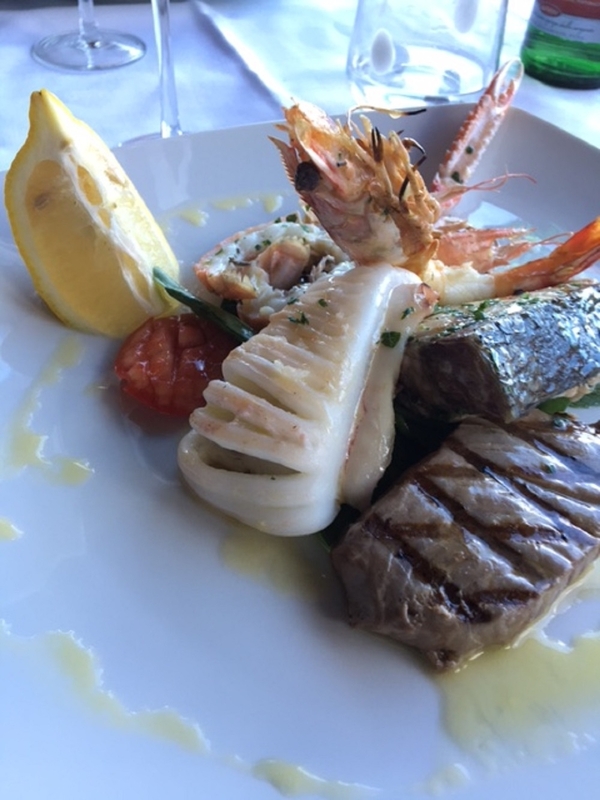 The Vistamare restaurant offers delicious dishes created by their chef Claudio Fortuna. The outdoor terrace offers views of the sea. Enjoy your after -dinner drink in one of their large salons next to the bar or sit outside on the terrace. All rooms are airconditioned and are elegantly furnished. Want to go to the beach? All you have to do is cross the street! Want to rent a private boat? Let the hotel make the arrangements! Very easy to do as the harbor is down the street from the hotel. The town is wonderful and offers many unique boutiques. The shopping here is endless. While staying in this town it is worth your while to visit Villa Durazzo which sits in the hillside and offers beautiful views of the gulf and is surrounded by a park and gardens. Worth a tour! Another great hotel our JDB team visited and experienced this past fall was the Mezza Torre Resort and Spa. This 5 star hotel is located on the island of Ischia just north of Capri. Ischia is a beautiful island and is noted for its thermal hot springs and relaxing beaches. It is a popular tourist destination for Germans and Eastern Europeans and for the Italians, who frequent this island as their holiday destination. We stayed on this island for two nights and had the opportunity to explore it. 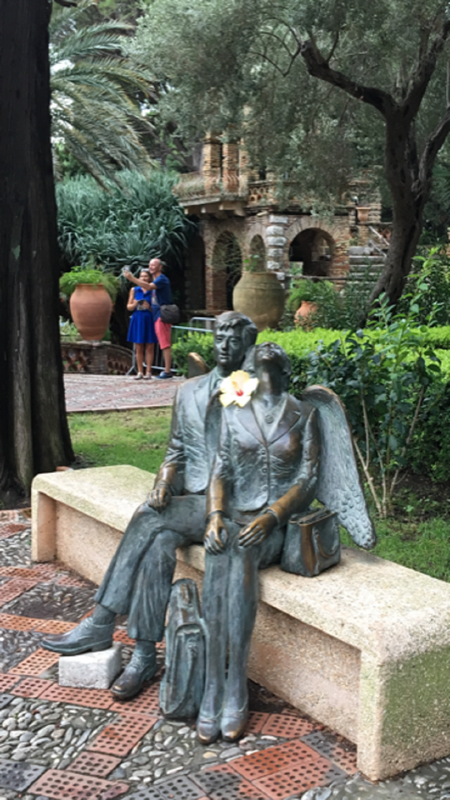 While staying here we had a special tour of the Botanical Gardens: Giardini La Mortella, the thermal spas and the small seaside town of Sant’Angelo. The Mezza Torre hotel has two personalities. The main tower houses a lobby, spa and some of the rooms overlook the blue sea. The other 50 rooms are spread out in a series of buildings on the grounds surrounded by woods. There is a private beach which is only used by the guests of the hotel. I did not take the opportunity to experience the spa but other members of our group did and they were thrilled with the offerings. The spa offers a full range of treatments using the best products. Within the spa they have their own thermal waters. Pool area at the hotel. The beach is next to this area. There are two restaurants at this lovely resort. One restaurant/bar is near the beach so you don’t have to go far to satisfy your appetite. We had the pleasure to experience this delicious food for lunch one afternoon and the chef really displayed his talents. The other restaurant which offers a full buffet breakfast and dinners is located in another area. The food here was top notch! Want that after dinner drink? The little piazza outside of the tower will satisfy your desire for such. Sit under the stars and let the waiter cater to your whim. If you are looking for a different island feel go no further and stay at this relaxing hotel with its own beach. You can fill your days with exploring other parts of this island: there are thermal spas to experience, shopping, a beautiful botanical garden, cooking classes, wine tastings and more. As I traveled with five other travel agents on a JDB Fam trip we were introduced to a fabulous 5 star hotel in the cliffs of the Amalfi Coast with beautiful views of the Bay of Salerno. Monastero Santa Rosa was once a monastery. It was here, in the 1600s, that the famous Italian sfogiatella was born. the nuns that lived and worked at this monastery created this special recipe. I thank them every time I eat one of these delicate and delicious desserts. After our tour, which included viewing all the different room categories, spa, garden, infinity pool and the outside gym, we were treated to the most delicious lunch on the terrace. The food was exceptional. By chance, I sat next to the manager, director of the hotel and he enlightened me about the chef's credentials. The executive chef: Christoph Bob has worked in many top restaurants throughout Europe before coming to Monastero Santa Rosa. Some of his restaurants include: Relais Blu Villa Hotel in Massa Lubrense on the Sorrento coast, a Michelin one star restaurant in Gragnano, a three star Michelin star in Paris, Naples and many more. He also has worked with Alain Ducasse and Heinz Beck. He uses only the freshest local ingredients. His dishes are a work of art! And so flavorful! A real culinary experience! This 20-room hotel has an extensive wine list and spa so if you so desire a peaceful and quiet stay this is the place for you. Let me mention that no children under the age of 16 are permitted to stay at this hotel. Other amenities include: bocce court, infinity pool, outdoor gym, wine cellar and spa, which includes: a sauna, steam room, and hydro pool. Relax after a day of sightseeing at the bar or library while sipping your cocktail. Other amenities include: Air conditioning flat screen TV, Minibars in all rooms, and spectacular sea views from every room! Put this hotel on your bucket list! Are you looking for that small boutique hotel in the middle of Tuscany? Look no further than this gem which is situated in Radda in Chianti – Hotel Palazzo Leopoldo. It is situated in the heart of Tuscany between Siena and Florence. It was once a hospital for abandoned children. Many years later it was transformed into a farm and in 2001 it was transformed into Palazzo Leopoldo! While traveling with a group of travel agents we had the pleasure of inspecting this hotel and stayed for lunch. We all fell in love with it. All the rooms are spacious with up to date amenities: Alarm clock, air conditioning, hair dryer, mini bar safe and more. Each room has a different décor, but all very classy and filled with antiques. Please note that there is NO elevator. All rooms have only showers in the bathroom. The hotel has an excellent restaurant and an indoor pool and beauty center. A lot to offer to its guests! Let me also mention you can take a cooking class in their beautiful fully equipped kitchen! Palazzo Leopoldo has two other sister hotels in Radda! Both of them are charming as well.